Thomas Ruff was born in 1958 in Zell am Harmersbach, Germany. He attended the Kunstakademie Düsseldorf from 1977 to 1985, where he studied under Bernd Becher. Ruff began photographing landscapes, but while he was still a student he transitioned to interiors (1979–83) and deadpan portraits of friends. His early portraits were black-and-white and small, but he soon switched to color, using solid backgrounds in different colors. He began to experiment with large-format printing in 1986, ultimately producing photographs up to seven by five feet in size. Ruff expanded beyond portraiture with Haus (1987–91), a series of building exteriors. In 1989, he produced a series of images depicting starry skies, derived from pictures he had obtained from the astronomy institute of the Ruhr-Universitt Bochum. Ruff's Zeitungsfotos (1990–91) are likewise based on appropriated imagery, in this case newspaper photographs blown up and stripped of their captions. In Blaue Augen (1991), he replaced the dark eyes in twelve of his earlier portraits with blue ones, subverting the authenticity of his own photographs. During the first Gulf War, Ruff used a night-vision enhancer to render ominous images of the streets of Düsseldorf at night in his Nacht series (1992–96). 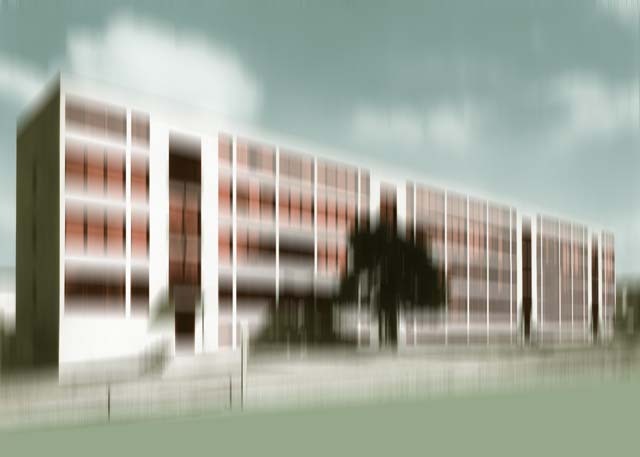 In 1999, the artist made a series of digitally altered photographs of Modernist architecture by Mies van der Rohe. His series of nudes (1999–2000) are also digitally manipulated images, but here he began with photographs from pornographic websites; his Substrat series (2002–03), based on images from Japanese manga cartoons, continued this exploration of digitally altered web-based pictures. For the Machine series (2003), Ruff made colored prints from large-format glass negatives of black-and-white images of vintage industrial machinery from the 1930s and 1940s. Ruff has exhibited widely since 1981. He lives and works in Düsseldorf.